Welcome to the first official Feasting Friday post! Every Friday there will be a post about something I have cooked, including the recipe, hopefully in time to inspire you to think about what you might make over the weekend, or to put it on your list for next week. I love a challenge, so feel free to let me know if you have a dish you've been looking for a good version of, or to share your own recipe for the same dish! Since the inspiration for this new feature is the recipe development I did for my new book, GOOD ENOUGH TO EAT , I thought I would start with something inspired by the book! When it comes to entertaining, as a passionate home cook and unabashed foodie, I certainly went through my ultra-gourmet phase. Every dinner party was an opportunity to pull out every trick in the book, every plating stolen from fancy restaurants and cooking magazines…vertical presentations and sauce-painted plates and uber-formal service. Essentially, I turned myself into a galley slave in my own kitchen, never able to fully enjoy my own parties. Luckily for me, I wised up and realized that the best parties are the ones where the hostess is relaxed and having a good time, and most importantly, PARTICIPATING, and not trapped in the kitchen making caramel spirals or composed salad towers. When I let go of the need to prove I could do all those culinary acrobatics and came to a place where all I needed to do was provide good food and good company, I started having a great time entertaining my friends. Yes, I can make Pommes Soufflés, those magical twice-fried potato slices that puff up in the second frying. But I am prouder of my Mashed Potatoes. Mashed potatoes were not a staple in my house growing up. In fact, the only mashed potatoes that ever got made at home were Instant Potato Buds, much to the horror of our cleaning lady who informed my mom that those were just for babies! 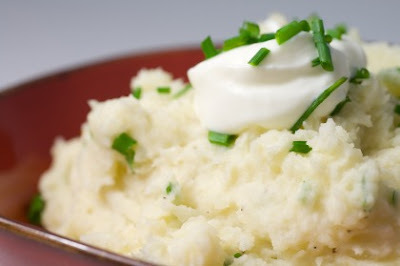 I didn’t learn how to make real mashed potatoes until I was in college, and once I started, there was no stopping me. They quickly became my most comforting of comfort foods, and one of my favorite things to make for dinner parties or to bring to friend’s houses for dinner. Simple, with just milk and butter and salt and pepper, or gussied up with cheeses or herbs or crumbled bacon. The ultimate soul-soothing mouthful, instant crowd pleaser, generically beloved and a good friend of veggies and proteins alike. When I was writing GOOD ENOUGH TO EAT , I had to think a great deal about comfort foods. The heroine, Melanie, is a formerly heavy woman who has worked very hard to lose half of her body weight through diet and exercise. In the process, she leaves her career in the law, goes to culinary school and does a certification program in holistic nutrition. In her new life as a chef, she has opened a healthy gourmet take-out café, focusing on providing her customers with food that is a delicious as it is nutritious, as satisfying for the soul as it is good for the body. And because I wanted to show everyone that it is possible to have healthy versions of the foods we all love without them tasting like lawn clippings and sawdust, I took my original recipes for decadent comfort foods and adapted them into healthier versions. The first place I started was Mashed Potatoes. 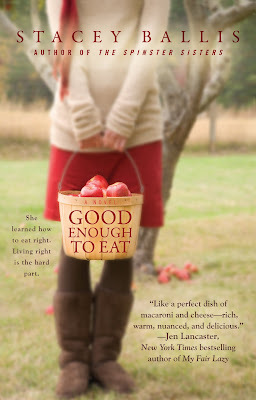 There are over 35 recipes in the back of GOOD ENOUGH TO EAT , and in most cases, they are a pair…one original version and then a companion lighter version of the same dish or a light dish that gives the same flavor profiles. Click here to Pre-Order your copy! For those of you who have no need or desire to lighten things up, I give you my personal go-to recipe, the mash I make for Thanksgiving and to bring to friends when they are blue and for dinner parties. For those of you who want to indulge without derailing a health-conscious program, I offer you a lighter version that is still delicious. Peel potatoes and cut into large chunks. Put in pot and cover with cold water. When water comes to a boil, add 2 tablespoons salt to water, and cook until potatoes are tender. Mash with ½ cup milk and the sour cream. Add more milk to get the texture you prefer. Add melted butter and chives and season to taste. I love me some mashed potatoes. There is no substitution for the homemade variety, be it light or decadent. I think I may make them this weekend with a nice steak.